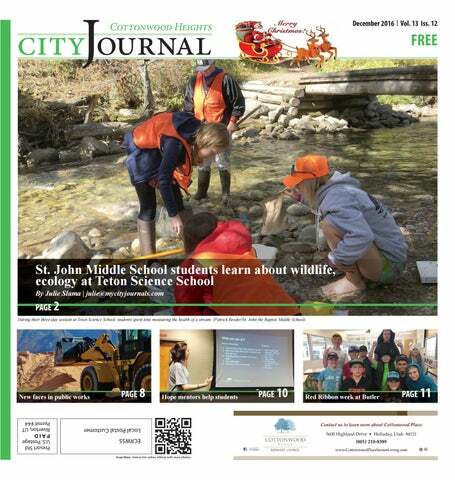 St. John Middle School students learn about wildlife, ecology at Teton Science School By Julie Slama | julie@mycityjournals.com The Cottonwood-Holladay City Journal is a monthly publication distributed directly to residents via the USPS as well as locations throughout Cottonwood and Holladay. 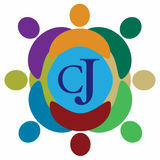 For information about distribution please email circulation@mycityjournals.com or call our ofﬁces. Rack locations are also available on our website. For subscriptions please contact: circulation@mycityjournals.com The views and opinions expressed in display advertisements do not necessarily reﬂect or represent the views and opinions held by Loyal Perch Media or the City Journals. This publication may not be reproduced in whole or in part without the express written consent of the owner. also offered several how-to books on how to write novels, the book market, how to get an agent and various book publishers. Additionally, writing classes were offered that will continue on after NaNoWriMo is over. Throughout the month, different libraries held weekly write-in sessions with supportive groups. These libraries included the Whitmore, Millcreek, Kearns, Smith, South Jordan, West Valley, Sandy and Hunter libraries. “All of our write-in events across the system have had lots of participants to share the success of writing their novels and do word sprints and bounce ideas off each other,” Seboard said. the business can be sued. “These protect you,” explained Jenkins. As far as taxes are concerned, sole proprietorships tax the business owner as well as the business. Since corporations pay owner dividends, they are taxed by the IRS. LLCs are taxed like sole proprietorships but can lessen the double tax burden. They are more ﬂexible. Small business owners have to establish themselves with the U.S. Department of Commerce. The department wants to know who the business owner is, who their registered agent is and who their members are. Depending on the business, additional licenses are required by the state. Along with licensing, small businesses also need an employment identiﬁcation number if they have employees. Jenkins said the most important advice she can give is to “make sure to have agreements written out.” This serves as selfpreservation and self-protection. Simple cleaning only for uninsured new patients. Not valid for those with discount plans or other program offers. Not valid with other offers. Expires 12/31/16. Not valid for those with discount plans or other program offers. Not valid with other offers. Expires 12/31/16. ope Squad students from Lone Peak High School talked to peers from around the state about suicide prevention. The session was one several lectures at the Utah PTA Vital Issues/Advocacy Conference. The program was held on Nov. 7 at the Granite School District Administration Building. Suicide is the leading cause of death in children aged 10-17, according to the Utah Department of Health. Paul Dymock, LCSW and Suicide Prevention Specialist from Alpine School District explained Hope Squad is a studentled, suicide prevention advocacy group. Hope Squad members are nominated from their peers. They are trained to identify signs of suicide and be a comfortable contact for peers. “What they do is go into the classroom and students present to students, which is way more effective than adults presenting to students,” Dymock said. Hope members offer information on causes, treatments and resources to fellow students. Dymock added that the support structure of Hope Squad includes trained teachers/ student mentors, counselors, administrators, parents, police and religious community members. “We’re ﬁnding that as we’re working and being involved the numbers are dropping and we’re seeing great successes,” Dymock said. Youth suicide rates in Utah have been consistently higher than the national rate. An average of ﬁve hundred and ﬁfty Utahns die annually from suicide and over forty-ﬁve hundred people attempt suicide each year. Three key factors discussed by the student presenters were failure, anxiety and stress. Jonathan’s Jewelry 6910 S. Highland Dr.
righton High School girls basketball head coach James Gresh has been the leader of the team for the past 18 years. During that time, the team has seen major wins and disappointing defeats. One of those defeats was last season’s loss in the quarterﬁnals of the state tournament. The Bengals lost to Sky View High School, located in Smithﬁeld, 78-42. “They were good. They were really good,” Gresh said about Sky View’s team. Two years ago, the Brighton Bengals snagged the 5A state championship from Fremont 49-40. Gresh hopes to bring back that tradition of winning. “We’re always in the running. We’re always in state contention. We’ve won three state championships in the time I’ve been there,” Gresh said. “We’ve won six region championships in the time I’ve been there. Our reputation is a quality team that is in contention every year for region and for state.” Since last season, the team has lost two seniors to graduation and another senior this year to early graduation. Gresh doesn’t seem too worried about the missing players. “We’re going to try and band together and play good basketball,” Gresh said. NOW HIRING Accounts Payable Clerk Challenger is seeking an analytical, detail-oriented individual to be an Accounts Payable Clerk at its corporate office in Sandy, Utah. The selected candidate will be a key member of a team of accounting professionals that support the Challenger Foundation mission and 26 school campuses in five states. This position offers a competitive salary, health benefits, a 401(k) retirement plan, and significant student tuition discounts for children or grandchildren. All levels of experience will be considered if accompanied by a strong work history. To apply, submit your cover letter, resume, and a brief essay discussing your view of America to hr@challengerschool.com. Challenger School admits students of any race, color, and national or ethnic origin. Challenger School is an Equal Opportunity Employer. Limit 1 per customer. Tax not included. Expires 12/31/16. ired of the same old shows every Christmas season? Treat your family to a delightful comedy that will knock your toeshoes off: “Nutcracker: Men in Tights.” This jolly holiday romp opens November 10. It’s Christmastime, and the small Utah town of Slagville is in financial trouble. The town council has come up with a tremendous plan to save them from disaster, they’ll put on a show! And what better show than “The Nutcracker?” Hoping to draw big crowds, they sign up a once-famous dancer, Maurice Money, who is trying to revive his career. But when a crabby town member, Candy Kancor, is overlooked for the show, she sets out to ruin everything. Chaos and hilarity ensue, culminating in the craziest production of “The Nutcracker” you’ve ever seen! “Nutcracker: Men in Tights” is written and directed by Scott Holman and combines wacky gags and zany characters with Desert Star’s famous brand of screwball comedy. This show will run from November 10 to December 31. The evening also includes one of Desert Star’s signature musical olios following the show. The “Let It Snolio” features many of your favorite, heartwarming Christmas songs, served up with a helping of Desert Star’s holiday comedy. Desert Star audiences can enjoy gourmet pizza, fresh wraps, burgers, scrumptious desserts, and other finger foods as well as a full selection of soft drinks, smoothies and a large array of iced and hot steamers and coffees while they watch the show. Food is available from an á la carte menu and is served right at your table.